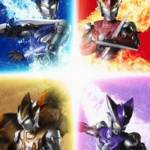 Kamen Rider and Ultraman S.H.Figuarts Coming to Gamestop? A screen grab from Gamestop’s own computers via Twitter user @ShadowThePika can confirm that these figures exist within the system and each one of these Figuarts will retail for reasonable 49.99 each and expected to ship out in February. Of course, we have no way of telling if Gamestop plans on carrying more of these in the future and it seems unlikely that they’ll carry anything P-Bandai exclusive. 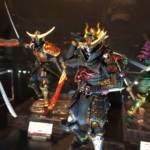 Still, this opens the floodgates for Kamen Rider collectibles to potentially come stateside! Gamestop exists outside of North America as EB Games, and while the two companies operate under the same umbrella it’s currently not known they’ll follow suit. Stay tuned, and we at Tokunation will provide you an update to this exciting development as it’s made available. First Look at S.H.Figuarts Ultraman R/B Lineup! 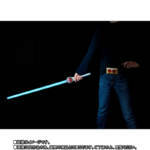 Bandai was certainly quick to hop aboard the S.H.Figuarts Ultraman R/B train this year, here are our first teaser images for the S.H.Figaurts Ultraman R/B line. 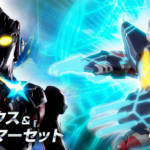 Four Figuarts were shown: S.H.Figuarts Ultraman Rosso Flame, S.H.Figuarts Blu Water, S.H.Figuarts Rosso Wind, and finally S.H.Figuarts Blu Ground along with what appears to be personalized Tamashii Act stage stands to correspond with each Ultraman form. The four will be released at Mass retail, Rosso Flame and Blu Aqua will come out December 2018 while Ground and Wind will come out January it’s unclear if the stands will be included as part of the accessory count or as a first run pre order bonus of some kind. Of course, this is all merely speculative based on what little information we currently have available. Stay tuned to Tokunation, and we’ll be sure to give you more up to date info as soon as it becomes available. 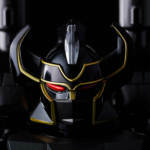 In case you missed it one of Tamashii Nation’s exclusive offerings for this year’s SDCC will be the SDCC SOC GX-76 Black Megazord repaint. SDCC is right around the corner, and many collectors have wondered what this Megazord variant will look like in either of it’s combined modes with the Dragonzord, well wonder no more. New photos have surfaced online showcasing what this figure will look like in the combined Mega Dragonzord and Dragonzord Battle Modes. The SDCC SOC GX-76 Black Megazord will be available exclusively at Bluefin Brands booth during San Diego Comic Con 2018. Be sure to check back with us, and we’ll bring you all the exciting news from that event as it happens. Seen only yesterday for the first time, Tamashii Nations has today released a full set of official images for S.H. Figuarts Ultraman X! 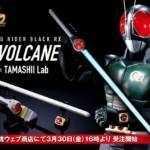 X has been a long demanded figure by fans, and it looks like Tamashii is pulling out all the stops to please them. A strikingly good likeness to the show suit, Ultraman X goes the extra mile by including actual usable Cyber Gomora Armor! This marks to return of full form changing gimmicks to the S.H. FIguarts line after a long hiatus and is indeed welcome to see. S.H. Figuarts Ultraman X will be a retail release in October 2018 and retails for 7560 yen. Don’t say NO! Just Live MORE! Continuing our jaunt through Kamen Rider Gaim, Bandai Tamashii just unveiled their prototype of the S.I.C Kamen Rider Gaim ichigo Arms, sporting a very sleek ninja-esque look. The prototype was seen on display presumably at the Tamashii Nations showroom in Akihabara thanks to Twitter user @kobax27. Currently, this piece remains as a display only figure and there’s no indication if Bandai will release this figure in some way or another. Stay tuned, and we’ll bring more info on this strawberry flavored release as it becomes available. › Companies: Bandai of Japan, Bandai, Bandai Tamashii › Characters: Kamen Rider Gaim Ichigo Arms › Show: Kamen Rider Gaim › Toyline: S.I.C. 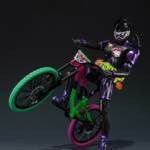 First revealed at the Tamashii Nations 2017 event last month, Bandai Tamashiis official release page for the Shinkocchou Seihou subline was just updated with new photos and release info for S.H.Figuarts Shinkocchou Seihou Kamen Rider 2. Kamen Rider 2 was teased for a May release window as a general mass retail release a little while ago, the date was confirmed by that very web page. 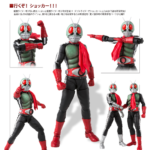 No word was given on price, but considering that the figure shares the same body as Kamen Rider 1 we can expect a similar 6,480 yen price point. Stay tuned, and we’ll bring you more up to date info along with any more pictures that get released. 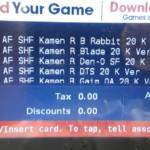 SH Figuarts Kamen Rider Build RabbitTank Release Details Confirmed- SH Figuarts NightRogue Teased! Bandai Tamashii has released a special promotional page for the next major entry in the SH Figuarts series- Kamen Rider Build! The release details for Build RabbitTank have been confirmed thanks to this posting: Build is currently scheduled for release in February 2018– which will mark the TENTH ANNIVERSARY of the SH Figuarts series! In honor of this momentous occasion, SH Figuarts Kamen Rider Build will have special pricing: a very modest 3456 Yen before shipping and handling! 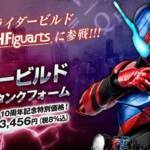 A video teaser uploaded by Bandai Tamashii gives fans a close look at SH Figuarts Build RabbitTank, AND offers a quick tease for the NEXT Kamen Rider Build Figuart release- the villainous NightRogue! Stay tuned to TokuNation as we keep you up to date on any further reveals for SH Figuarts’ 10th anniversary!